“>More physical and emotional heft than almost anything you might see on Broadway. Ralph B. Peña (Artistic Director of MaYi Theater Company), Angel Desai and Kenneth Lee (Steering committee members of AAPAC – Asian American Performers Action Coalition), are special guests in this post-show conversation about the disproportionate representation of Asian-Americans in New York theater. Ethnically diverse panel of prolific playwrights Nastaran Ahmadi, Branden Jacobs-Jenkins, Matthew Paul Olmos, A. Rey Pamatmat, Stefanie Zadravec and a cautionary tail playwright christopher oscar peña discuss the challenges of writing racially diverse themes and characters in the New York theatrical landscape, moderated by Obie Award winning director Eric Ting. A play of impossible choices – set in a world of magical characters. First generation Chinese-Americans growing up in New York City, siblings Vivienne and Luke confront their confused tangle of family, their diverse array of friends, and their rampant sexuality. In our digital age, how can they navigate the traditional expectations of their mother with their American culture of individuality? “In a time when very few Latino playwrights seem to grace the stages of New York Theater, identity politics are often severely over-simplified. After a year of shocking and offensive yellow-facing on some of the worlds most prominent stages, I couldn’t be more thrilled to be having the world premiere of a cautionary tail happen at The Flea with diverse cast of actors who represent not only New York, but what America looks like to me,” says christopher oscar peña. 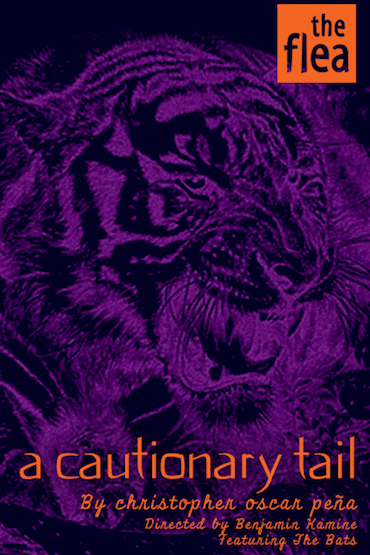 a cautionary tail was commissioned by NYU’s Tisch School of the Arts’ Graduate Acting Program (Mark Wing-Davey, Artistic Director). The cast features The Bats, the resident acting company at The Flea, and includes many actors from recent hit Flea shows such as These Seven Sicknesses, Job, and Restoration Comedy: Alton Alburo, Barron Bass, Matt Bovee, Madeleine Bundy, Jenelle Chu, Sasha Diamond, Karen Eilbacher, Bobby Foley, Aaron Parker Fouhey, Alex J. Gould, Cleo Gray, Alex Grubbs, Marlowe Holden, Christine Lee, Evan Maltby, Bonnie Milligan, Jacquelyn Revere, Stephen Stout, and Tony Vo. The creative team features Set Design by David Meyer (Labyrinth Theater Company), Lighting Design by Jonathan Cottle (Flea Resident Designer), Costume Design by Andrea Lauer (American Idiot, Bring It On: The Musical), Sound Design by Jeremy S. Bloom (Flea Resident Designer), and Movement Direction by Laura Brandel (Hit The Wall). christopher oscar peña (Playwright) is a playwright from California currently splitting his time between New York City and Chicago. He received his B.A. in Dramatic Arts from U.C. Santa Barbara where he studied with Naomi Iizuka and holds an M.F.A. in Dramatic Writing from NYU’s Tisch School of the Arts. His plays include maelstrom, l(y)re, i wonder if it’s possible to have a love affair that lasts forever? or things i found on craigs list, icarus burns, the suicide tapes, alone above a raging sea, and TINY PEOPLE (or, it gets better). His work has been developed or seen at The Public Theater, Two River Theater, New York Stage and Film with The Lark, Ars Nova, NYUGrad, INTAR, Rattlestick Playwrights Theater, The Flea Theater, The Ontological Hysteric Incubator, art.party, American Theater Company (Chicago), Son of Semele (LA) and The New York Theatre Workshop, among many others. With Vayu O’Donnell, he is the creator and co-star of 80/20, a new series for the web, which was named an Official Selection at the 2013 New Media Film Festival in LA. An alumni of INTAR’s Hispanic Playwrights Lab, he has also been an Emerging Artist Fellow at NYTW, a Writing Fellow with The Playwrights Realm, and was a recipient of the Latino Playwrights Award from the Kennedy Center in Washington, D.C. He has been a visiting fellow at the O’Neill Playwrights Conference, the Sewanee Writers Conference in Tennessee, featured in the Crossing Borders Festival with Two River Theater and has also been in residence at the Orchard Project. In 2011, christopher traveled to London as part of the T.S. Eliot US/UK Exchange with the Old Vic New Voices where his play however long the night premiered on the Old Vic stage. He was the Lark Play Development Centers 2012 Van Lier Fellow, and is currently working on a commission for the Goodman Theatre where he is in residence as a member of their Playwrights Unit. He is represented by Kate Navin at Gersh and Henry Huang at Station 3. Benjamin H. Kamine (Director) is a stage director and designer based in Manhattan. He recently directed the world premiere of Thomas Bradshaw’s Job at The Flea Theater (Timeout Critics’ Pick, “a jolting treat” – Ben Brantley, New York Times). Other directing credits include Medea’s Got Some Issuesby Emilio Williams (Best International Show 2012, United Solo Festival at TheaterRow), Why Me? by Leah Nanako Winkler (Asking for Trouble at EST), The Man Under by Paul Bomba (59E59), and an immersive audio theater piece with Tommy Smith called Nectarine EP. He is a resident director at The Flea Theater and at the Jewish Plays Project and is a member of the Lincoln Center Theater Directors Lab. He has developed work with The New Group, The Flea Theater, EST/Youngblood, Barefoot Theatre Company, Primary Stages, and the Jewish Plays Project, directing readings and workshops of plays by Bekah Brunstetter, Robert Askins, Nick Jones, and Trish Harnetiaux, among others. He also works throughout New York as a sound, lighting, and projection designer, and is a Guest Artist at the Lab School for Collaborative Studies.